Warner Bros. What will he do for immortality? Brad Pitt is Achilles in Troy. With a coincidence that even Hollywood rarely permits itself, two of the most heavily promoted and generally extreme motion pictures of the year derive from two richly ambiguous incidents in the ancient past that permanently influence Western civilization. The political uprising in an obscure corner of the Middle East, culminating in the Crucifixion, and the amphibious raid on a settlement in Asia Minor, known as the Trojan War, contribute immeasurably to the art, literature, and culture of the societies, nations, indeed empires that succeed the Greeks and the Romans. The culture we know, from its laws to its poetry, could not exist in its present form without the record of those events. No wonder the cinema returns again and again to the Bible and the Homeric epics. The makers of Troy acknowledge that their film is "inspired" by The Iliad, which enables them to deviate from a number of the poem's material. They omit a great many people and actions, insert others that actually derive from other sources, and seriously alter matters of character and motivation. Cassandra and Philoctetes, among many humans and all of the gods, for example, never show up. Ajax only manages a cameo appearance. The Trojan Horse and the death of Achilles, not included in the poem, occur in the movie (what director could resist them?). And Agamemnon, whom they turn into the chief villain, never makes it back to Greece to be killed by Clytemnestra and inspire a remarkable tragic cycle. Homer sang of the wrath of Achilles, the greatest of the Greek heroes, who directs that anger at both Agamemnon and Hector, the greatest Trojan warrior. His squabble with the king causes him to spend much of the poem sulking in his tent, while his fury at Hector's killing of his beloved friend Patroclus drives him to a shameful desecration of the Trojan's body. 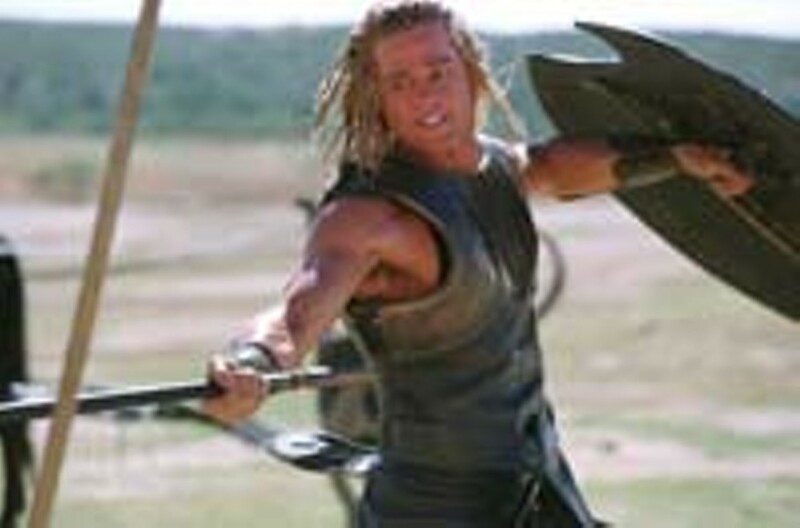 In the film, Achilles (Brad Pitt) displays both the petulance and the relentless desire for a hero's immortality that ultimately motivate his actions. Yet he also understands the mixture of melancholy and sweetness that an awareness of doom imparts to a brief and glorious life. The few moments of introspection allowed Pitt's Achilles reveal a surprising hint of complexity that few of the other characters exhibit. Most of the others behave according to a simple, superficial, sometimes strictly Hollywood interpretation of the Homeric originals. The nobility of Hector (Eric Bana), the weakness of Paris (Orlando Bloom), the megalomania of Agamemnon (Brian Cox), the beauty of Helen (Diane Kruger), the intelligence of Odysseus (Sean Bean), and so on, seem the single characteristic that defines each. Peter O'Toole as Priam, king of Troy, father of Paris and Hector, exhibits a measure of depth that most of the others lack, comprehending from the beginning the sadness and suffering the war will exact from both his family and his nation. Thanks to the brilliance of contemporary film technology, Troy continues the grand Hollywood tradition of the spectacular. Since the early days of the silents, American film excels in the epic mode. The thousand ships of Agamemnon's fleet make a magnificent and thrilling display off the shores of Troy and the walled city really looks impregnable. The bloody battle scenes employ the usual enormous and hyperactive cast, and the huge, ominous Trojan Horse suggests the dark destiny it contains. In Achilles' words and deeds Troy also reflects one of the major themes of The Iliad, the Greek regard for permanence through human memory. Given the choice of a long, peaceful life of contentment and obscurity, or a brief moment of existence and an eternity of fame in history and poetry, Achilles naturally chooses the short, glorious life of a true Greek hero. He frequently exhorts his troops to seek immortality. All the characters, in fact, speak self consciously of their belief that this war will make their names known to all people always. And, as the hundreds of spear carriers and horse holders enshrined forever in Homer's poem prove, they are entirely correct. Muscular and handsome, arrogant and mercurial, Brad Pitt makes a perfectly acceptable Achilles. The English accent that he and all the actors adopt, apparently in the belief that it confers a certain dignity and, well, classical class, gradually grows tiresome and laughable. But he moves with a convincing athleticism and now and then quite wonderfully assumes the familiar postures of the Greek warriors on all those vases we know so well. The other actors behave with competence if not distinction, given the essentially static and superficial nature of the script's interpretation. The film's necessary amplitude and excessive concern for dignity occasionally slow the pace, but for the most part it bubbles with energy and it always looks terrific. Troy (R), stars Brad Pitt, Eric Bana, Orlando Bloom, Diane Kruger, Brian Cox, Peter O'Toole; directed by Wolfgang Petersen. Loews Webster, Pittsford Plaza Cinema, Regal Greece Ridge, Regal Culver Ridge, Regal Eastview, Regal Henrietta.